Identification: This is a bright orange species with scattered cream tubercles. The gills and rhinophore sheaths are lined with cream and the branchia are tipped with purple. Natural history: Martadoris limaciformis is known from a single animal found under a rock in a moderately exposed rocky location at a depth of between 3 and 6 m (10 and 20 ft). 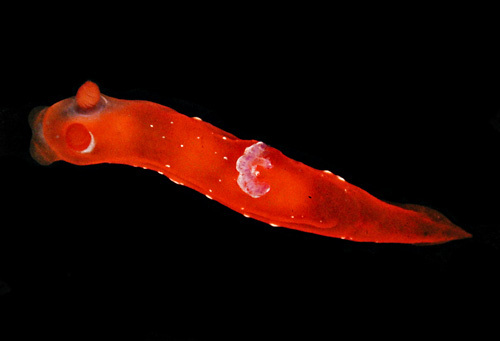 Taxonomic notes: It was first recorded in Hawaii from west Maui by CP on Sept. 4, 1995 and was known as Tambja limaciformis until Martadoris was erected by Willan & Chang, 2017. Photo: PF: 10 mm: found by CP; west Maui: Sept. 4, 1995.